ITHACA, NY (WSKG) – About ten parents in the Caroline Elementary School PTA met with two officials from the Ithaca School District Monday night. They wanted an update about the status of the water. It’s been shut off for over two years because of elevated lead levels. Caroline is a town in Tompkins County southeast of Ithaca. The school receives water from a well which means the school district is responsible for it, not a municipal water authority. 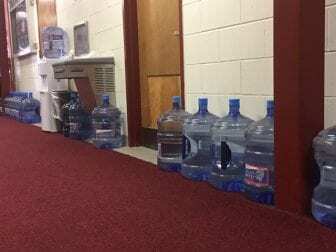 Water approved for drinking in hallway of Ithaca High School. Alan Karasin is the PTA’s Treasurer. He has a kindergartner and a third grader at the school and says the district needs to communicate better so parents understand what’s going on. “There’s been a long time passing without much information about what the remediation was,” he said. “We would get periodic reports that things were being replaced but we didn’t exactly know what or when. Amanda Verba, the school district’s COO is in charge of the lead remediation projects. She has said the district is working to re-build parents’ trust. The district representatives assured the PTA that parents and school officials will be notified before the water is turned back on. They expect that water in the elementary schools will be turned on in December or January.